Serves for detection of increased sulfur concentration (segregations) in steel and counts therefore as etching process (see also Etching). If a bromide paper that was soaked in 5 % sulfuric acid is pressed on the metallographic specimen of a steel sample, the sulfur-containing sections of the paper turn dark. The sulfuric acid reacts with the sulfide inclusions and forms hydrogen sulfide. This again reacts with the bromide paper to dark silver sulfide. 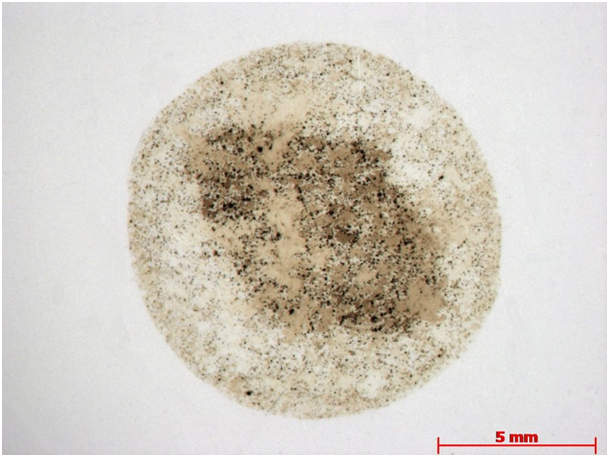 This indicates the distribution of the sulfide inclusions (figure 1) in the material. The print is secured, watered, dried and can thus be archived.